CFQ is now under the editorial control of the creatives responsible for the hit films Free Enterprise and The Specials and the original Sci-Fi Universe magazine, and will be better than ever! Featured in our first issue under the guidance of Mark A. Altman (writer/producer Free Enterprise) and David E. Williams (The Hollywood Reporter) is THE YEAR OF THE SUPERHERO, with Daredevil, X-2, Hulk, Superman, The League of Extraordinary Gentlemen, Prime and more. Features in this issue will cover Exorcist: The Beginning, the remake of Seconds, Lawrence Kasdan’s Dreamcatcher, Enterprise, the hit series The Dead Zone, Rob Zombie’s controversial directorial debut House of 1,000 Corpses and the upcoming animated film Through the Mobius Strip. 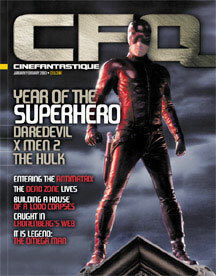 This issue's CFQ Interview is David Cronenberg, discussing Spider. Extras include an expanded review section, including a final-word pro-and-con showdown on Attack of the Clones, and extensive coverage of comics, video games, books and DVDs. Renew your “sense of wonder” with the new CFQ.